New York Speech & Hearing: the premier center for audiology, hearing healthcare, communication disorders & voice pathology in Manhattan, New York City. Our connections and our relationships start with communication. Located in the heart of Midtown, we offer a comprehensive array of services related to the evaluation, rehabilitation and prevention of communication impairment. From treating hearing loss to voice and swallowing issues, we work hard to provide complete care for all your communication needs. We specialize in complete hearing healthcare for music industry professionals – including hearing conservation consultations, fitting with musician’s products, and sound engineering consultations. We are dedicated to improving communication to ensure you live a happy, active life and enjoy all your relationships. 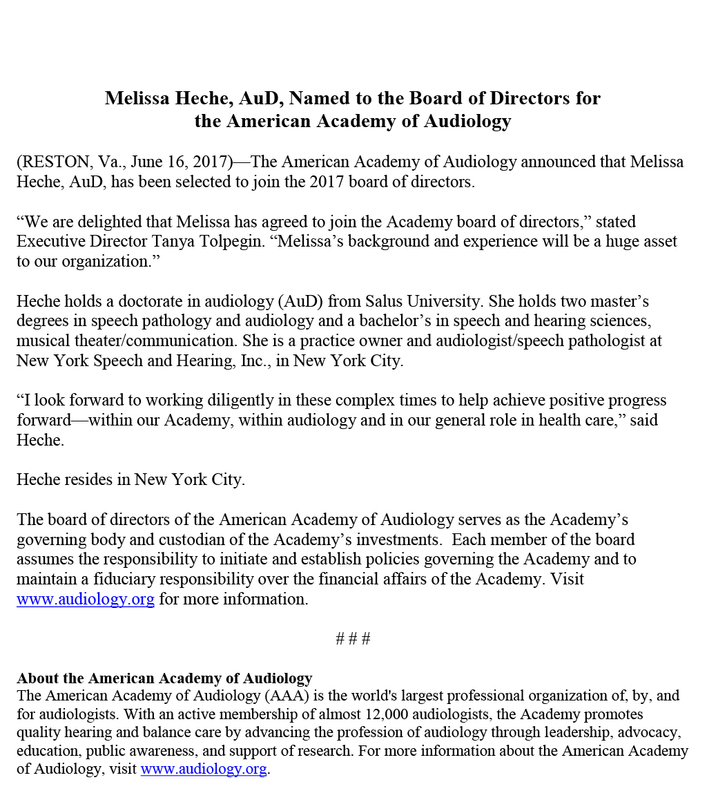 Dr. Melissa E. Heche is serving a term as the Treasurer of the American Academy of Audiology – she is currently serving on the Board of Directors. Helping to shape the future of Audiology & improve access to Hearing Healthcare. Click here to read the press release. Think you have a hearing loss? Schedule an appointment to check it out! Ask about our hearing screenings.